"You, and me, we're different. We don't have to dream that we're important. We are." The good guy, seeks to defeat the villain, save the princess, find the treasure, etc. Generally the central figure in Action Series and Adventure Series. Always wins in the end. 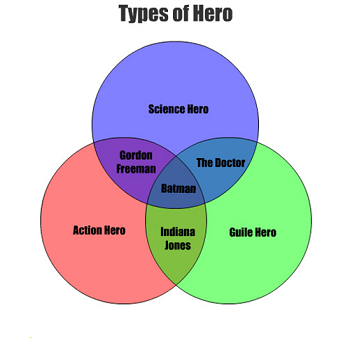 This list is about different kinds of hero characters. We also have a specific list of Hero Tropes, which are ways that heroes are made heroic in storytelling. If you are looking for something about the show of the same name, try Heroes (TV series) (and if a link from another page sent you here instead of there, feel free to correct it -- no-one may ever know you did, but Virtue Is Its Own Reward!). This page was last edited on 16 May 2018, at 00:35.